Both clothing and gifts in the ancient world have separately been the subject of much scholarly discussion because they were an integral part of Greek and Roman society and identity, creating and reinforcing the relationships which kept a community together, as well as delineating status and even symbolising society as a whole. They have, however, rarely been studied together despite the prevalence of clothing gifts in many ancient texts. 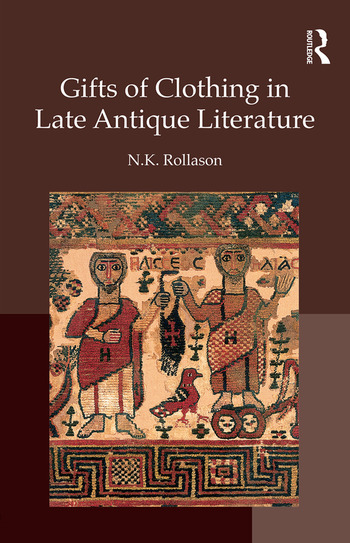 This book addresses a gap in scholarship by focusing on gifts of elite male clothing in late antique literature in order to show that, when they appeared in texts, these items were not only functioning in an historical or 'real-life' sphere but also as a literary space within which authors could discuss ideas of social relationships and authority. This book suggests that authors used items which usually formed part of the costume of authority of the period - the trabea of the consul, the chlamys of the imperial court and the emperor, and the pallium of the Christian bishops - to 'over-write' wearers and donors as confident figures of 'official' authority when this may have been open to doubt. Introduction / Threads of history: clothing gifts in Greek and Roman society before Late Antiquity / Weaving a tranquil work of peace? Clothing gifts in Late Antique diplomacy / Portable portraits: consular Trabeae and figural decorations in Late Antiquity / Holy habits: clothing gifts in Late Antique Christian contexts / Drawing the threads together / Conclusions / Bibliography / Index. N.K. Rollason studied at the University of Nottingham for her BA (Hons) in Classical Civilisation and MA in Ancient History. After a period of working in the public sector she completed her PhD in Classics at the University of Nottingham in 2013. Both during and after her doctoral studies she worked as a Teaching Affiliate at the university, in addition to convening a course in Medieval Latin for MA and undergraduate history students at Nottingham Trent University. She is currently an Honorary Research Fellow and a Teaching Associate in Classical Studies at the University of Nottingham.